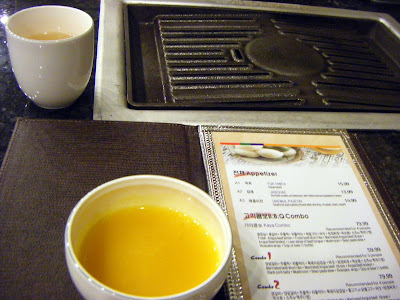 One of the frequent complaints I hear about Korean restaurants involves what’s perceived as lousy service. “We had to hail our waitress six times!” “Customers were holding up their empty side dishes, begging for more!” “I watched people get up pour their own tea!” Yeah, yeah, I know. 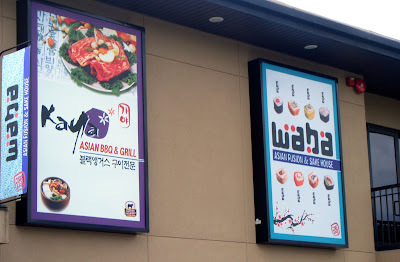 That’s the charm of Greater Seattle’s many Korean restaurants: they’re here to cater to the Korean community. 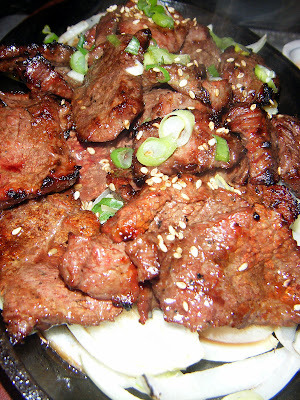 And therein lies the rub: those perceived deficiencies are merely the cultural norm at the multitude of Korean joints I regularly frequent — the very ones that make Highway 99 (north or south) my very own highway to Korean-food heaven. To better understand the food and dining culture, neophytes should get their hands on Steven Shaw’s helpful compendium, “Asian Dining Rules: Essential strategies for eating out at Japanese, Chinese, Southeast Asian, Korean and Indian restaurants.” Or, if you’ve yet to be introduced to Korea’s vibrant cuisine, pay a visit to Kaya Asian BBQ & Grill in Shoreline, open just over a month (at 20109 Aurora Ave. N., 206-546-2848) and conveniently located due west of the Aurora Village Costco. Polish sausage at Costco or grilled rib-eye at Kaya? You decide. Time to eat: bring on the barbecue! Once you’re shown to your seat by the host or hostess, you’ll find that unlike many Korean restaurants, Kaya offers attentive service as well as the kind of distressed concrete floors you might expect to find in a bistro in Belltown or Capitol Hill. Granted, I could live without the flickering flat-screen TVs, but I’m hard-pressed to name a Korean restaurant without them. Half the dining area is given over to tables with inset grills for do-it-yourself barbecue, above which hang the stainless-steel umbrellas of smoke-sucking hoods. By the way, if you’re one of those people who wonder, “Why should I go out to eat and then cook the food myself?” they’ll grill your meal in the kitchen. In fact, that’s what they do if only one diner at the table orders barbecue. 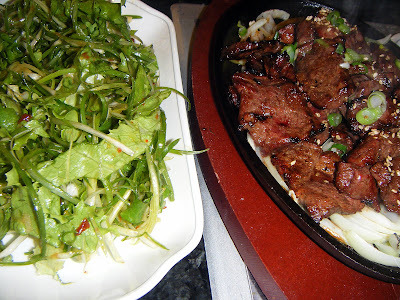 They don’t use the words “Korean” to advertise the restaurant, but you will find the usual full-quid of Korean-style barbecued beef, pork and chicken — along with appetizers big enough to feed a crowd. They’ve got the requisite fried fish-on-the-bone, spicy tofu soups, and stews invested with the kinds of seafood or meat-parts unsung at, say, nearby Scott’s Bar & Grill. 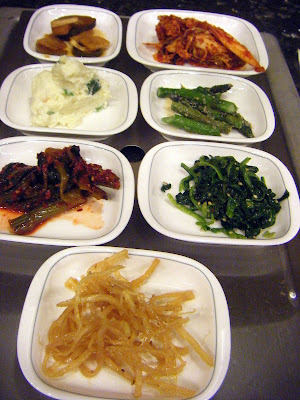 And yes, of course they make bibimbap — and its sizzling-rice-in-a-stone-bowl sibling, dolsot bibimbap. What, you don’t like dried squid (front and center)? Then ask for more potato salad. 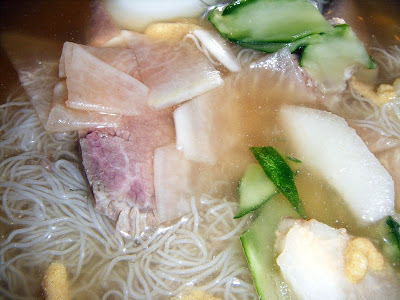 Ice-cold beef noodle soup? Cool. Kaya? Waba? What’s up with that? I’ve since learned that Waba is the as-yet-unopened adjoining restaurant and bar, set make its public debut in early summer offering cocktails and sushi (Kaya serves beer, wine and shochu). 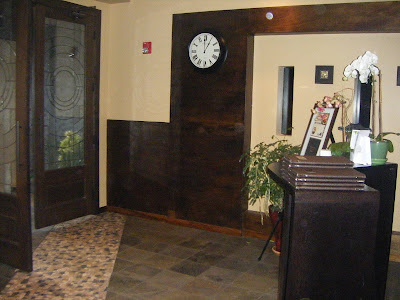 Because I’m nosy, I poked my head in there yesterday and was impressed to find a spacious, Asian-inspired dining room and bar with much in the way of dark wood accents. One that, on quick inspection, brought to mind Umi Sake House. It also had a spectacular view across the highway of that distant destination, Home Depot. I called today to get more details and chatted with A.J. Kim, who used to work for T-Mobile and now manages the service staff. A.J. explained that in the interim, Waba is being used to host large catered events, everything from birthday parties to funerals. 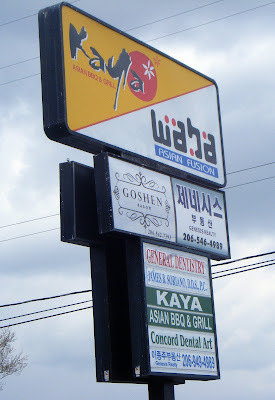 Kaya and Waba are co-owned by a quartet of investors, he says, a group that includes a dentist and two construction contractors, all of whom may be found lending a hand at the restaurant. When I complimented A.J. on his service team, he said their goal is to offer the kind of finer-dining experience meant to make Kaya — and eventually, Waba — a magnet for Koreans of every age, and a must-stop for everyone else. I’d say they’re off to great start. Kaya’s open daily for lunch and dinner.